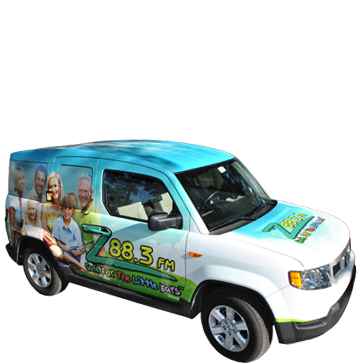 Thank you for your interest in requesting that a Z88.3 station vehicle attend your event. Please fill out the following form entirely and hit submit. The Z88.3 Promotions Department will then look over the event information and consider it for a Z Stop. You will receive an answer either way by the end of the month preceding your event month. Thanks for stopping by to request a Z Stop for your event! Z Stops are offered as a free resource to our community. If booked, the Z will usually set up a booth or table, where we sometimes offer coloring, yard games and fun giveaways, depending on the event set up. We want to make sure that you know how Z Stops are booked and make sure you feel it is the right fit for your event before moving forward with your request. I am submitting my event at least 30 days in advance. I understand that Z Stops are not assigned on a first come, first serve basis, no matter how early I submit this request. I understand that Z88.3 looks at all the events for a particular month as a whole the week before each month begins and book stops based on staff availability as well as other station events and calendar bookings. I also understand that I will not receive an answer before that time and requesting a Z Stop is not a guarantee that Z88.3 will be able to be there. I understand that if my event is booked, Z88.3 will set up a booth at the event, but will not broadcast live from the event. I also understand that Z88.3 will not provide sound equipment for my event. I understand that Z Stops do not provide free advertising on the radio. Event information for Z Stops booked will be placed on our Z Stop page at Zradio.com and on our Facebook events page. I understand that if my event is booked as a Z Stop, my event may receive a mention or two on the air, but this is not guaranteed. I am the person in charge of the event being submitted, and will be the contact for Z88.3. Please fill out this section with your information. If you are not the contact person in charge of this event, please have the person in charge of the event requesting the stop fill out this form. Example: Manager, Event Organizer, Coordinator, Pastor, etc. Please fill out the following information about the organization who has full control over all aspects of the event that you are submitting. This information is about the organization, the next page will have questions about the actual event you are submitting. Please pick the description that best fits your organization. The organization in charge of this event is a non-profit 501(c)(3) organziation and has the documentation to prove this statement. This organization in charge of this event is a for-profit organization. In this section you will be filling out information about the actual event that you are requesting a Z vehicle to attend. Please tell us what time your doors will open for your event. Please tell us what time your event will begin. Please tell is what time your event is scheduled to end. Please tell us the name of the location where your event is being held. Example: Church name, park name, etc. Please tell us the street address for the location where your event is taking place. Please enter the direct link to the website where information for this event will be posted. Have hosted this same event in the past? Yes, we have previously hosted this event. No, this is the first year for this event. How many times have you done this event in the past? Please give us the approximate number of people who attended the most recent event. Please give us the approximate number of people that you expect to attend this event. Please select which station you're requesting. Has Z88.3 been involved in this event in the past? Yes, Z88.3 has been on site for this event in the past. No, Z88.3 has not been to this event. Has Hot 95.9 been involved in this event in the past? Yes, Hot 95.9 has been on site for this event in the past. No, Hot 95.9 has not been to this event. Has GPraise been involved in this event in the past? Yes, GPraise has been on site for this event in the past. No, Gpraise has not been to this event. Has TheRockHD.com been involved in this event in the past? Yes, TheRockHD.com has been on site for this event in the past. No, TheRockHD.com has not been to this event. Please check the event type that is closest to your event. Would you like us to play music at our booth? Please tell us how much you are charging per ticket. If it is a free event, please write the number 0. If other organizations are involved, please list them here. If there are no other organizations involved, please write the word none in the box. Please answer this question by checking one of the boxes below. Yes, there is a fee for admission into this event. No, there is not a fee for admission. This event is free to attend. Yes, there is separate fee for admission into this event that is separate from the concert ticket price. No, there is not separate fee for admission, it is included in the concert ticket admission price. The entire event and concert are both free, and no purchase is necessary to enter. Please tell us how much you are charging per ticket for the concert portion of this event. Please tell us the cost of admission for your event. Please tell us the cost of admission for your event that is separate from the concert ticket cost. If it is free to get into the community event portion, please enter 0 into the table. Please check the box that best describes rides and bounce houses being available at your event. Yes, rides and bounce houses are available at this event, and they are free to use. Yes, rides and bounce houses are available at this event, and there is a cost to use them. No, rides and bounce houses are not available at this event. Please tell us the cost per person to ride rides or use bounce houses at your event. Yes, food is available for free at our event on a first come, first serve basis. Yes, food is available at our event for purchase. No, food is not available at this event. Please tell us how much parking will be for your event. If there is not a parking fee associated with your event, please type in 0 as the amount. Yes, other radio stations and media will be present at this event. No, no other radio stations or media will be present at this event. Please list all other radio stations and media who will be present at this event. Please separate each name by a comma. Example: Z88.3, Channel 6 News, etc. By providing in depth details to your event allows us to envision how we can possibly serve you and the community. Let us know anything extra that you would like us to know about your organization or this event that may not have been covered in the questions above.